The College has always been well represented among winners of the Phillips Scholarship, which rewards leadership in community service. The Jay and Rose Phillips Foundation awards $16,500 scholarships to outstanding students at Minnesota's private colleges who intend to dedicate a portion of their lives to community service. 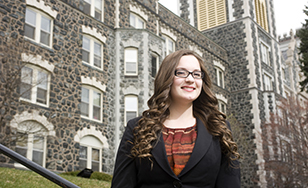 Now Justina Brusacoram has become St. Scholastica's 15th Phillips Scholar. That's the most from any school in the state. The Scholars are required to design and implement an eight-week community service project during the summer before their senior year. Brusacoram, a nursing and psychology double major, selected a cause with a profound personal connection: youth empowerment. "The project's goal is to target younger high school-age students to provide a motivational platform for personal growth and empowerment," Brusacoram said. "That's very near and close to me. I relate to a lot of these students - I was the first in my family to attend college, and the first to graduate from high school." She'll create a new local organization, Duluth Youth Speak, to partner with existing agencies to mentor young people. "I want to give them connection, mentorship, empowerment, a voice and some validation that they can make a difference," Brusacoram said. The students will create presentations in the style of the popular "TED (technology, entertainment and design) Talks," which will be submitted to the TED organization.